Taoism is the ancient Chinese wisdom tradition that is based upon the study of the Tao. Tao is the way of the divine source revealed in the natural world. 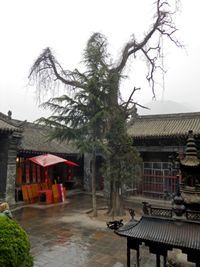 The roots of Taoism reach back to the ancient Shamanic traditions of China 3,000 years ago. These currents were eventually expressed in poetic philosophy by the sages Lao Tzu and Chuang Tzu. They taught that the source of all manifestation was ever present but beyond the limitations of verbal expression. The way to experience Tao was to become receptive, to empty the mind of limiting preconceptions and to harmonize and flow of nature. Since these beginnings, various schools of Taoism developed each stressing a different way of becoming more receptive and harmonious. Some traditions stressed ritual and philosophical contemplation while others focused upon the purification and transformation of the body through the practice of meditation and breathing exercises. Some aspects of this knowledge were taught openly for popular consumption, while others were kept secret, a practice maintained until very recently. Both a popular and a secret tradition were taught and continue to the present time. The popular tradition took the form of a very colorful religion that served the needs of the common person. The secret tradition focused on spiritual development intended for the serious practitioner, it contained the methods of emptying and purifying that the serious student used in their spiritual development. Today, Taoism in the United States is characterized by the emergence of the “secret” traditions into the marketplace of the New Age subculture and the Kung Fu martial arts. There is now a wide variety of Taoist methods and disciplines readily available to the interested student.